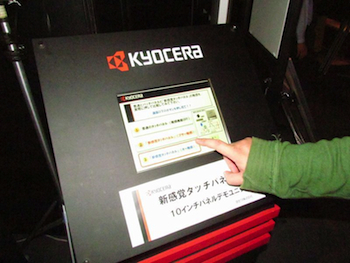 Japanese technology firm Kyocera has come up with a new touchscreen, which it demonstrated at the Digital Contents Expo in Tokyo last week. It uses similar technology to that which gives us haptic feedback, and when described, may remind you of Research in Motion’s SurePress technology seen on its Storm phones. As fans of SurePress are a rare breed, and haptic feedback regularly splits opinion between phone users, this may not sound overly enticing. However, in reality, it’s considerably more exciting than both. Designed to provide a more tactile typing experience, Kyocera uses piezoelectricity to vibrate the screen at a very high speed when you touch it with your finger, which apparently provides a feeling that resembles touching a physical key. Kyocera hopes to implement its new screens on a variety of devices, from smartphones to in-car displays. The increased tactile response and positive feel will certainly help with using touchscreens in the latter. The benefits don’t stop there either, as it’s expected to help improve typing accuracy on smartphones and tablets, plus it should have some intriguing uses in touchscreen gaming, where the lack of physical keys makes some games not only more awkward, but less satisfying too. There’s no information on when — or even if — Kyocera’s screen tech will find its way on to a mainstream gadget, but it’s a safe bet we won’t be seeing it on the iPhone 6 or Galaxy S4. Kyocera make a variety of quirky phones, so if it’s going to appear anywhere, we’d imagine it’ll be on one of those first.